What is the definition of Impact Investing? At its core, impact investing is about deploying capital with the intent to bring about some socially desirable outcome with the expectation of a financial return. Baked into this definition is some subjectivity. Specifically, what may be a socially desirable outcome for one person may not be the same for another. Nonetheless, generally, the social outcomes investors seek are unlikely to face much dispute even from the most critical investors. Some of the causes impact investments often support include; lowering greenhouse gasses, eradicating poverty, increasing economic opportunity for underrepresented communities and feeding the hungry. The expectation of financial returns is significant because it is what separates impact investing from philanthropy. What else should I factor into the definition? In addition to the two basic elements, an intention to do good and expectation of financial returns, some institutions add a third factor, impact measurement. The thought is if you intend to do good, you should measure how much good you’re doing. We explore measurement in more detail later. Within these 3 elements, there’s a lot of wiggle room, often guided by individual investor’s goals and personal interests, their priority on returns vs social outcomes, and the methodology they apply to outcome measurement. As suggested above, impact investing can be associated with an acceptance of below-market returns. While this is certainly true for some products, many impact vehicles now work to meet or beat market returns. As you can see there are some common threads within the definition. As the industry matures, it is likely a standard definition will be accepted by all stakeholders. 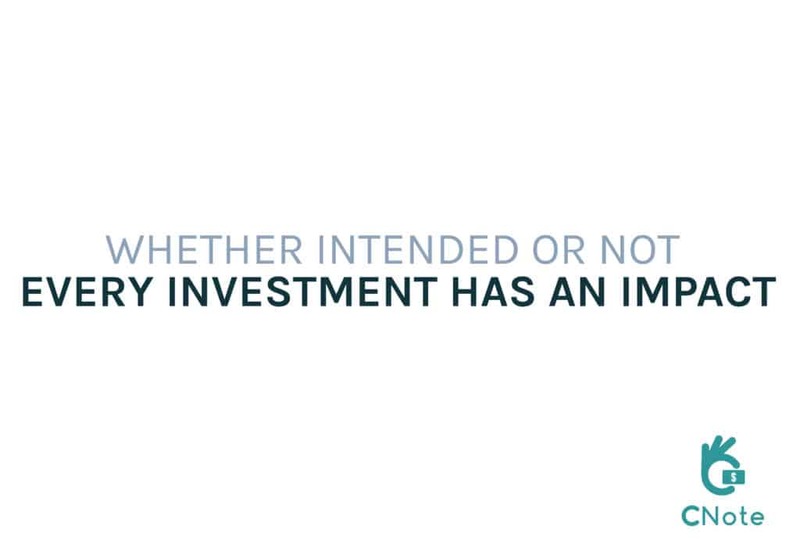 How does CNote define Impact Investing? At CNote we agree with the generally recognized definition that impact investing involves deploying capital with the aim of creating some measurable positive social outcome with the expectation of financial returns. Because whether or not you are targeting a social outcome when investing, your investment decisions will have consequences on society. This is because the flow of capital will incentivize or disincentivize actions by entrepreneurs and businesses on the aggregate–intentional or not, your money has an impact. Ultimately, the important question we should ask before we make any investment is: What social outcomes does this investment support, and are those outcomes aligned with my goals and values? The question then is one of intentionality; are you being conscious about what your money is doing and are you aligned with the outcomes it is supporting? This is extremely important knowing that even small investments in the aggregate can drastically shape industries, corporate behavior, and societal outcomes. In recognition of the notion that every investment choice has a consequence, our hope is that in the long term, impact investing as a standalone term becomes redundant and will just be called “investing.” As impact investing matures and becomes more standardized and measurable, many of the “niche” metrics we use now to measure impact may become as essential as metrics like the Price/Earnings ratio. Why does the definition of Impact Investing matter? How and where you invest is important. Understanding how the industry and individual participants approach impact investing can help you ask more informed questions and ultimately make better choices for where you want to put your money to work. Impact investing, as a movement, is still evolving and seeking standardization. It is important to understand how various industry leaders define the term and how it affects their approaches and methodologies–which can vary widely. At CNote, we want you to make the most informed investment choices. Hopefully, this article leaves you with a better understanding of how to approach impact investing as an investment strategy. The GIIN (Global Impact Investing Network) has created Impact Reporting and Investing Standards (IRIS) metrics to provide a standardized way to compare different investment options. While the GIIN is highly regarded, there are over 500 metrics and applying and making sense of these metrics can be challenging for the unfamiliar and can be cumbersome for even experienced impact investment practitioners. Another route towards standardization is by aligning investments with the United Nations Sustainable Development Goals (SDGs). The 17 SDGs were adopted by all 193 UN Member States as part of the 2030 Agenda for Sustainable Development. These goals are an urgent call for action to solve the world’s greatest development challenges, ranging from an end to poverty and reduced inequality to tackling climate change. Many impact investors are now aligning their goals and investments with the SDGs. The general consensus is that they are a useful framework and common language through which we can all communicate broader sustainability efforts. It is also generally appreciated that alignment is an ongoing process with most still trying to figure out how to get it right. As a result, there are movements by impact investors and measurement institutions to incorporate the SDGs into their impact measurement frameworks. Toniic institute has developed the SDG Impact Theme Framework and the IRIS metrics have been aligned with SDG indicators that they deemed appropriate for investment. Moreover, IRIS is launching, IRIS+, which should include a more comprehensive look at the SDGs. The complexity of these metrics highlights another issue, the approach to impact investing depends on who the investor is. To illustrate, large institutional investors may specifically require; risk models, impact measurement audits and put in place other restrictions that a retail investor may not. Moreover, a retail investor may want to see tangible short-term outcomes; homes built or jobs created, among other metrics, whereas an institutional investor may have a longer time horizon or seek outcomes that are harder to quantify. Understanding the audience and their expectations will radically shape how one views a given impact investment. The term ‘Impact Investing’ was created in 2008 at meetings convened by the Rockefeller Foundation in Italy. Although the definition is relatively new, the tradition of Socially Responsible Investing (SRI) is not. Religious communities have been practicing SRI for thousands of years and it can be traced to biblical times, as outlined in Jewish and Sharia law. This SRI involved making no investment in alcohol or tobacco, which is today regarded as negative screening. United-States-based SRI can be traced back to the 18th Century to the Methodists who also employed negative screening, extending it to include gambling as well, and to the Quakers who banned investment in slavery and war. The modern roots lie in the Vietnam and Civil Rights Movements notably with South African Apartheid and divestment from the country. In the 1990s and 2000s, this shifted from negative screens to positive screens. The term broadened and in the preceding decades impact investing as it is today was born. Today, impact investors can be, but are not limited to; fund managers, development finance institutions, foundations, government agencies, NGOs, pension funds and insurance companies, religious institutions, and individuals. Recently there has also been a rise in the number of online impact investing platforms, like CNote, which have made impact investing widely accessible to all individuals. The existence of impact investing highlights the current paradigm shift in how the business and investment community is thinking about; place, planet, product, and processes. This shift materialized as the double bottom line approach, which is measuring performance in terms of not just financial considerations but also social impact, and triple bottom line which adds environmental impact into that discussion. This evolved into SRI, and the introduction of negative screening, and ESG which incorporates Environment, Social and Governance factors into the investment process. Socially responsible investing is focused on deploying investment dollars in a responsible and positive way. Typically SRI involves the use of negative screens or filters when selecting investments. Often these screens ensure that a fund avoids investing in certain things the fund manager deems undesirable like companies that produce weapons, tobacco, and oil. In contrast, impact investing actively seeks out investments that will create a positive economic, social, or environmental impact. 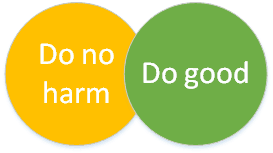 Another way to think about this is as “do no harm” for SRI versus “do good” for impact investing. What about Environmental, Social and Governance (ESG) Investing? ESG investing is about critically viewing an investment target’s environmental, social, and governance practices in the due diligence phase of investment. The key difference between ESG and impact investing is that ESG typically serves as a screen to weed out companies with unacceptable practices, whilst still prioritizing the maximization of financial returns. For example, let’s say an institutional investor was evaluating investments in multinational clothing companies, they may view supply chain practices as a key ESG metric because they want to make sure any target companies avoid the use of child labor and ethically source their raw materials. ESG is most commonly used in the context of public market investing, where one is evaluating the environmental, social and governance structures of a given company and evaluating whether that entity is taking sufficient steps to meet or exceed specific areas of corporate responsibility. Some research suggests these ESG-focused investments can actually lower the riskiness of an investment. To illustrate, if you know a target company maintains an ethical supply chain, the risk of damaging headlines about child labor practices (and an associated drop in stock price) are greatly reduced. Impact Investing occurs across asset classes and with a broad range of financial instruments. The main asset classes include; fixed income, real assets, public and private equity and private debt. The majority of impact investments are currently in private equity and private debt. There are ongoing discussions by many in the field about whether impact investing could emerge as its own asset class because it drives development and uses specialized metrics and benchmarks, but this is yet to be seen. What can I expect in terms of Financial Returns? Returns will vary greatly based on the type of investment and the market size related to the social issue. While the market for improving crop yields in developing countries is likely large, both in terms of potential financial and social rewards, the same may not be true for addressing something like increasing societal interest in the arts. What to expect for financial returns depends solely on the strategy and philosophy of the investor. Anyone considering an impact investment, or any investment would be well served to ask the fund manager or company, about what their priorities are, how they measure success, risk, and other non-investment outcomes. How popular is Impact Investing? What many don’t realize is that impact investing has grown to become a serious force in the investment world which dictates the flow of billions of dollars in capital each year. 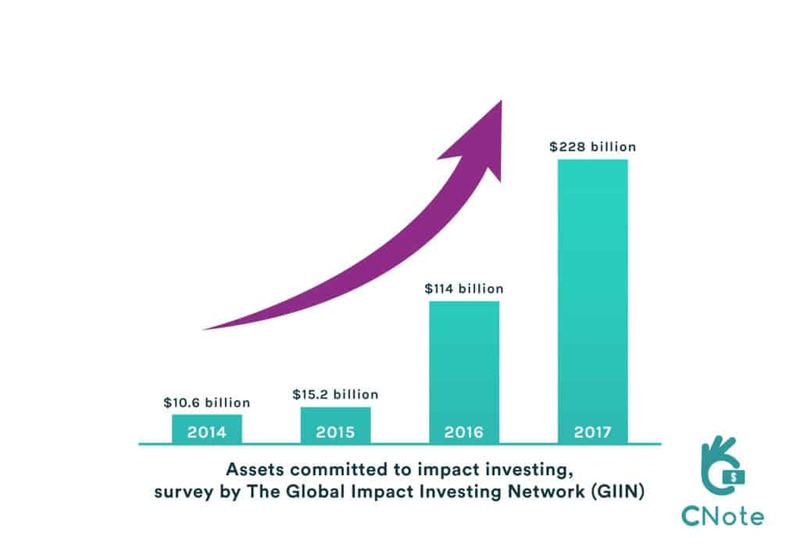 In 2017, according to GIIN’s Annual Impact Investor Survey of 225 companies, the total amount invested in impact funds was at least $114 billion. This is up from 2015 and 2016 when the impact investing market totaled $7.1 billion and $15.2 billion, respectively. Financial giants like Goldman Sachs and Zurich Insurance are now earmarking $13.7 billion toward impact investing. BlackRock, the world’s biggest asset manager, has created a division solely devoted to impact investments. There is also attention from international organizations like the UN which has gathered over $62 trillion USD from more than 1,500 asset managers to fund the Principles for Responsible Investment. 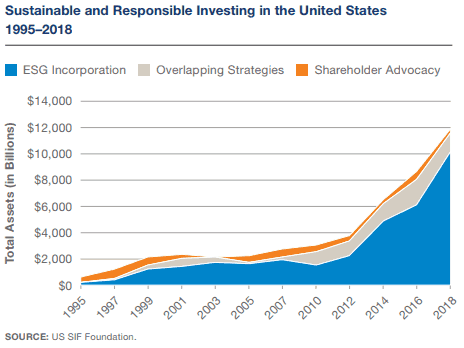 While the chart above only reflects those surveyed by the GIIN, the chart below from the US SIF: The Forum for Sustainable and Responsible Investment, shows that over $12 trillion in assets have been deployed across ESG, SRI and other impact-focused strategies as of 2018. Established institutions aren’t the only ones interested in impact investing. Since 2008, Google search reports for “impact investing” have increased significantly. The trend does not show any likelihood of tapering. In a recent survey of over 1,300 financial advisors and analysts, the CFA Institute found over 50% considered ESG integration a major priority and were taking steps to include it in their analysis. Moreover, the world is about to see a massive transfer of wealth from baby boomers to millennials. By 2020, millennials will have an estimated cumulative wealth of $24 trillion, and surveys show a whopping 76% of them believe how they invest can have an impact on responsible investing. Further studies show that millennials are 2x more likely than the average investor to invest in companies with social or environmental goals. Explore more statistics indicating the rising trend at Morgan Stanley. 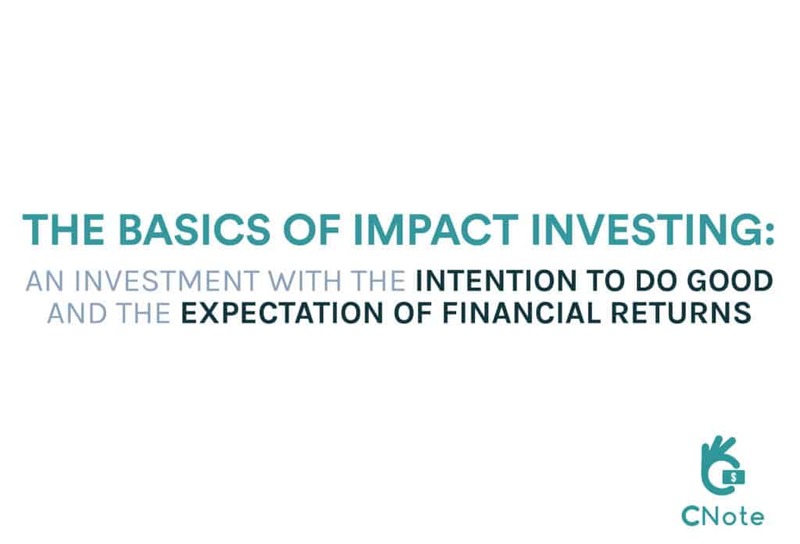 Here are just a few reasons to impact invest. This list is not exhaustive, and what moves one investor may ring hollow for another. Align your investments and your values – because impact investing does good and generates financial returns, investors can support the causes they care about whilst putting their capital to work. Increase Portfolio Stability – A Morgan Stanley study, of over 10,000 equity mutual funds over 7 years, found that, on average, impact investing funds had lower volatility than comparable non-impact funds. Expand your network – The impact investing community includes ppolicymakers entrepreneurs, human rights activists, and development experts, all dedicated to utilizing capital in pursuit of tackling important societal issues. The world of impact investing is not without faults. Like any booming industry, there are those who would co-opt the concept for profit. 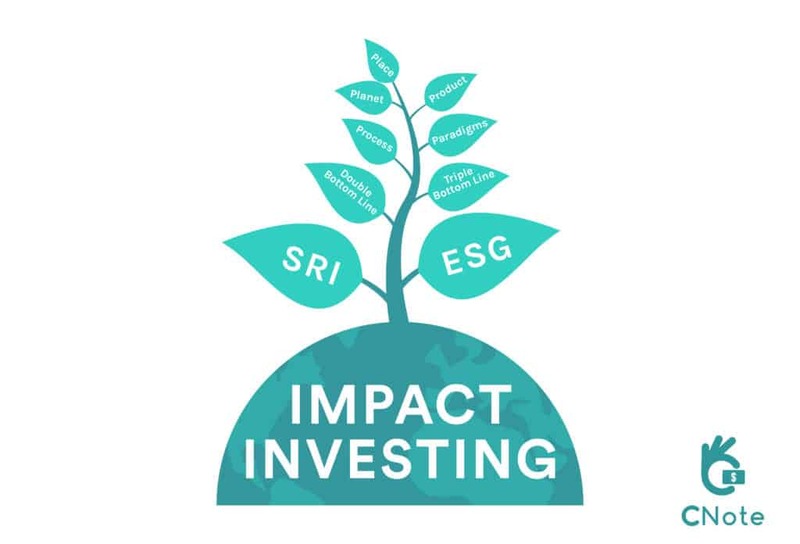 Impact investing is having a golden moment of rapid growth and popular support and, according to Business Wire, is expected to grow to $307 billion by 2020 (2x what it was in 2017). As a result, some investment vehicles ostensibly use the “impact investing” label without actually committing to the underlying strategy, in an effort to attract investors. 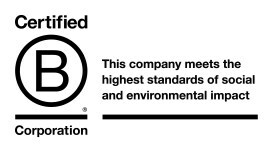 Sometimes this is referred to as ‘greenwashing’. In the impact investing industry, there are many that are concerned that mainstream asset managers are increasingly promoting and marketing ‘impact strategies’ without sufficient evidence that they are following through with these claims, measuring and reporting towards them. Unfortunately, this means that impact investors must carefully review investment documents and scrutinize impact measurement practices to assure that the product they are investing in accomplishes what it claims to do. Another potential pitfall of impact investing is a lack of understanding or analytical rigor around quantifying the effect an investment has on a specific issue (like affordable housing). For example, with microloans, lenders track number of borrowers, repayment rate, and business growth. However, knowing this information doesn’t necessarily capture the true impact, or what that community would look like without its microloans. In some instances, measurement may be too difficult given a myriad of variables, in other cases, it may simply be impossible to fairly measure a given investment’s impact. Another popular critique is that impact investing is skewed towards the wealthy and, by allowing for positive social impact and market-rate returns, keeps the concentration of wealth with the already well-off. Whether you actively seek to align your dollars with your values, it’s clear that impact investment is rapidly growing and is changing the status quo of capital allocation. Traditionally, funding and loans were only available to people with great credit or leverageable assets. Impact investing changes this dynamic by looking beyond financials and seeing whether your investment will generate positive social returns, not just financial ones. Ultimately, impact investing breaks down the perceived wall that exists between capitalism and social good. We can have our cake and eat it, too. Previous PostCNote in the News: A Retail Impact Investment Revolution in the Making?